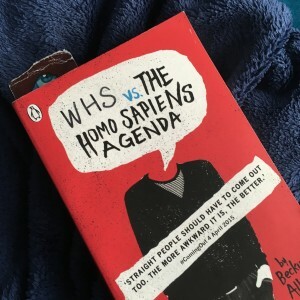 My attempt to get through all the books I own but have never read got off to a good start yesterday, as I both started and finished Simon vs the Homo Sapiens Agenda by Becky Albertalli, the first book on my gotta-read-em-all list on Goodreads. I’m pretty sure I won’t be keeping up the one-book-a-day pace, particularly as the next book on the list is Pride and Prejudice. Simon vs the Homo Sapiens Agenda is about a gay American teenager who has yet to come out. The only other person who knows his secret is ‘Blue’, another gay teen who Simon met through a school Tumblr. The boys communicate through anonymous email accounts, with neither knowing the other’s true identity. When Simon accidentally leaves his gmail logged in on a school computer, another kid in his class finds out and uses it to blackmail him. Simon is an extremely endearing character, and the central mystery of Blue’s identity is nicely played out. It’s a very enjoyable read, and I liked the way Albertalli captured both the extreme sensitivity and self-obsession of being a teenager. It even got me listening to Elliott Smith while I read at one point. (I’m not a fan of listening to music while reading, as I like to give a piece of work my full attention, but Simon’s musical choices are so integral to his character that it just felt right.) I’d pretty much dismissed Smith when I first heard him back in 1997, but then I that was more on the basis of finding the girl who kept gushing over him really annoying, rather than his music. I was wrong, and so I’m very grateful to Albertalli, not just for an engaging and interesting book, but also for my latest playlist! 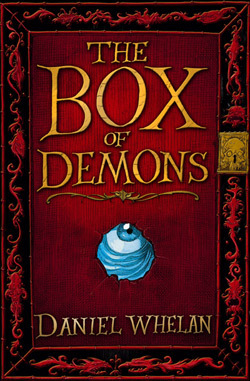 My copy of WHS, sorry, Simon vs. the Homo Sapiens Agenda, complete with Box of Demons bookmark poking out the top. This book is one of my more recent purchases. I’d seen a bit of buzz about it on Twitter, but wasn’t planning on buying it; I’m never that keen on things set in American high schools, because I don’t really understand the references they make to things like freshmen and homecoming. But when I saw it at my local WH Smith for 50p, I thought it was probably worth a go. I’m spoiled for bookshops in my neck of the woods, with three different independent booksellers (Pickled Pepper, Big Green Bookshop and Muswell Hill Children’s Bookshop) all within ten minutes of my house. When I go book shopping, I go to one of them. But my local WH Smith has a large ‘clearance’ section, which is mostly where the Graham Norton autobiographies and One Direction stickerbooks of yesteryear go to see out the twilight of their days, but I’ve also picked up a ton of books I’ve always wanted to read but never thought to buy at incredibly cheap prices. Sometimes it’s shop-soiled stock, others it’s just that they bought too many copies and want to get rid of them. In the case of Simon… however, it appears that they accidentally put a bound uncorrected proof on sale by mistake. A proof is a copy of a book the publisher sends out to reviewers and retailers months before release, often without the final cover on, which is why my copy is called WHS vs. the Homo Sapiens Agenda. It doesn’t even have a barcode, and the end pages feature quotes from Penguin staff talking about how great the book is, as well as their email addresses so the retailer can get in touch. Donate. I enjoyed it, but I think it would be a lot more loved and read in a school library than it would on my shelves, so that’s where it’s going to end up.